There is no need to fear the syndrome of the blank page! It is easier to start your BOTNATION journey with some examples. This is why we provide free bot templates. These tools can be used as the basis to get quickly started and understand how BOTNATION.AI works. We add new templates regularly. There are some templates corresponding to all situations, for instance, real estate agencies, restaurants, dating sites, a quiz, etc. Do not hesitate to use these completely free tools! 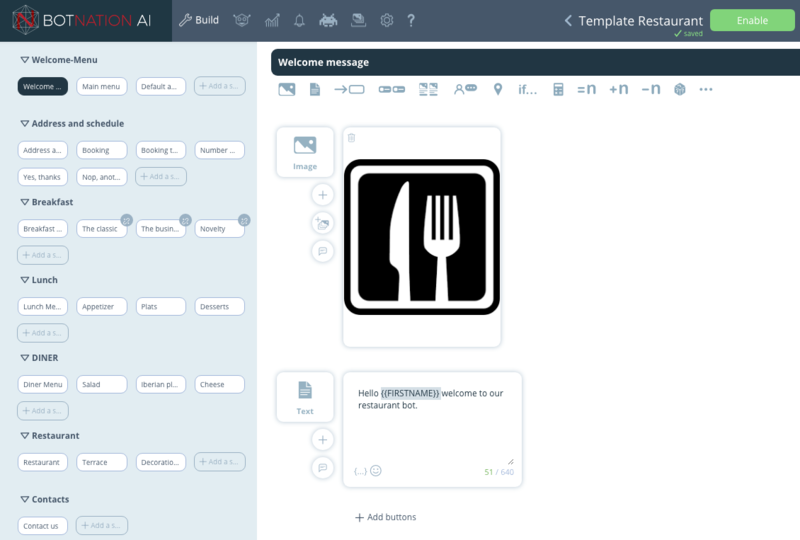 Furthermore, if you have ideas for cool templates and would like to propose some, feel free to contact us via our bot. How can I activate a bot template? 2. Choose one of the orange color models located at the top of the screen. 3. Select one by clicking on "add". 4. This selection of yours is now available in your account and is ready to be used.